Silke Natschke is a visual artist, currently living in Frankfurt, Germany. Until recently she lived for four years in Washington, DC. She graduated from Johann Wolfgang Goethe-University in Frankfurt with a master in American Literature and Culture, Philosophy and Political Science. That still provides the inexhaustible source of her inspiration as an artist. 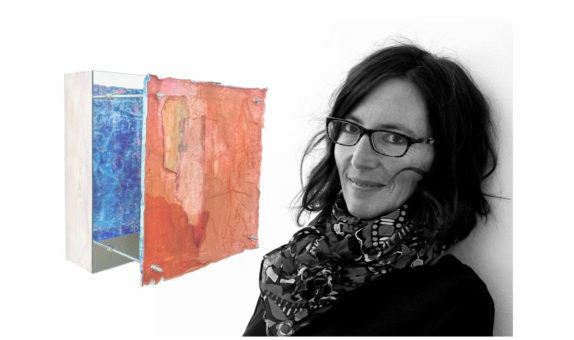 Philosophical and literary themes are constantly to be found in her work and feed her curiosity needed to venture into experimenting with different materials. Producing art is synonym with the attempt to make sense of the world. Colors are used unbiased to create in a manner that reminds of writing a diary. Experimenting with new techniques brought forth the current art series “Two faces”. It is an exploration into the possibilities of liberating color from traditional carriers. Conventional ways of showcasing pieces of art are questioned at the same time. They come alive by the tension in having the two sides or faces coexist. That evokes the ambiguity of the human state, which can be considered as the original idea for the look and feel of this work. The process always allows the spontaneous traction towards the artist’s experiences. Aesthetically, the two sides are different but there is a continuity that stems from a devotedness to the realization that the inner dialogue between the ego and the soul is a necessity. They permeate each other and communicate, making a passionate relationship.